Pangong Tso, from the Indian shore, looking towards China, July 2015 (photograph: Heathe Kelly). 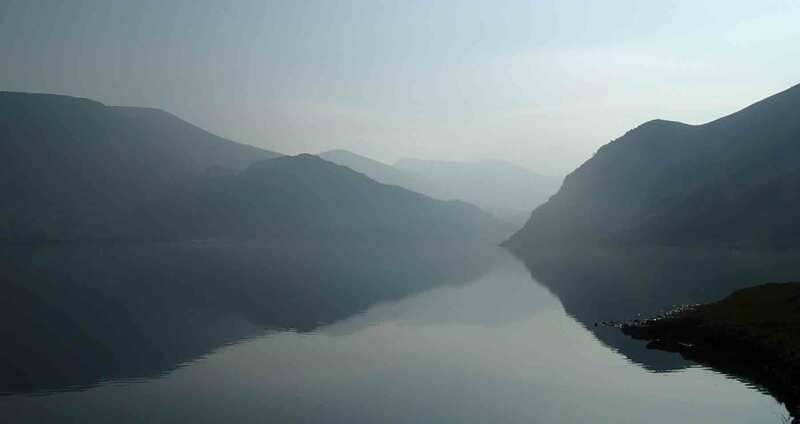 You may remember that a year ago I wrote some posts about a high altitude lake on the India-China border (see “Subaquatic landscapes in Pangong Tso” and references therein). This year, Heather made a second trip to Pangong Tso (described here) under the auspices of Indus Experiences and brought me back another sample from the littoral zone. 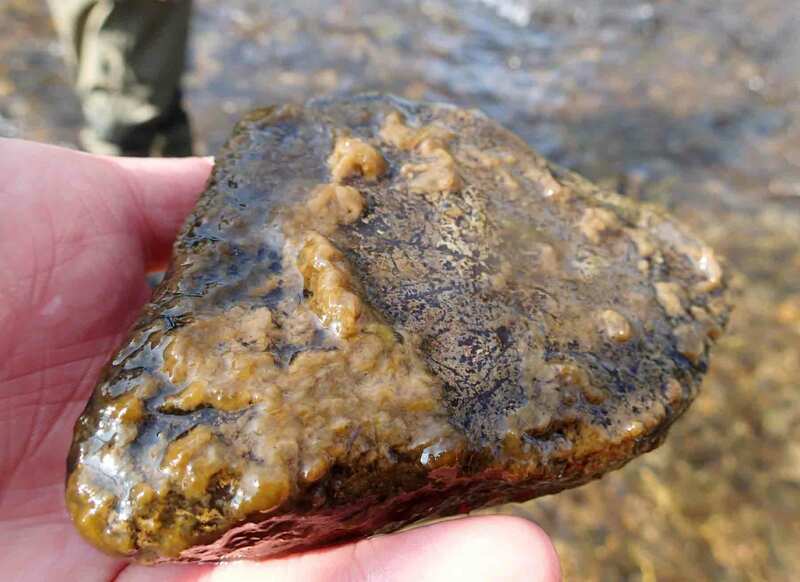 There was a beautiful thick biofilm here, an unusual bright yellow-brown colour and a jelly-like consistency, but bubbling away as the algae photosynthesised busily. 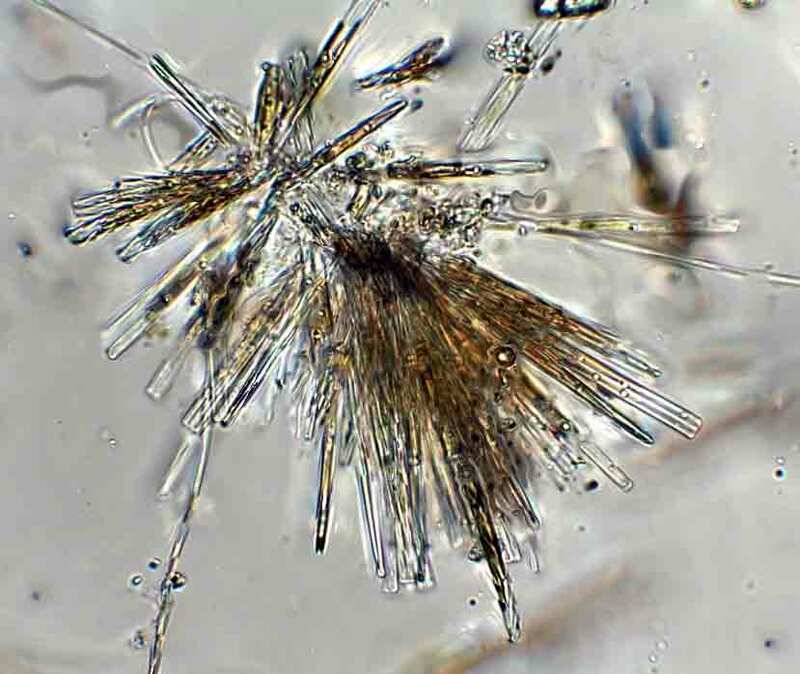 Once again, local vodka was pressed into service as a preservative and, once again, peering through my microscope a few days later, I could see that the sample was dominated by the same long-stalked Gomphonema species that I recorded a year ago (see “Diatoms from Pangong Tso”). The jelly-like consistency did worry me, as this is not what I would expect of a pure growth of diatoms and I did wonder if there were cyanobacteria growing amongst the diatoms that had not survived the journey home in their marinade of cheap vodka. Growths of diatoms (predominately a long-stalked Gomphonema sp) on a boulder in the littoral zone of Pangong Tso, India, July 2015. 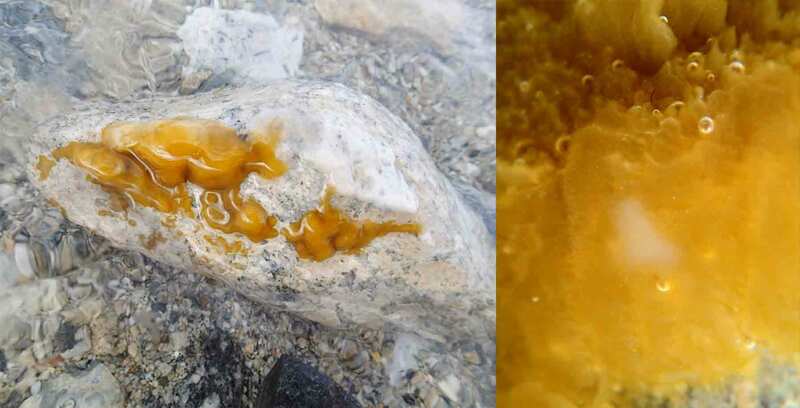 The right hand image is a close up showing oxygen bubbles being produced by the the jelly-like masses. Photographs: Heather Kelly. Intriguingly, the Gomphonema seems to occur in two forms: a fatter form, with a width around eight micrometres, and a narrower form, about six micrometres wide. I’ve written before about how diatoms tend to get shorter over time (see “Diminishing with age”). What I did not make clear in this post is that cell breadth tends to stay relatively constant during this process. This does not happen with every species but it is interesting to see that the fat and narrow forms have overlapping sizes, so it is not a simple matter of the narrow ones being the far end of the size reduction sequence. More work is definitely needed here although, alas, I don’t think Pangong Tso is on the itinerary for next year’s visit to India. Gomphonema sp from the littoral zone of Pangong Tso, north India, July 2015. a. – d. represent the “fat” form; e. – h. are the narrower form(s). Scale bar: 10 micrometres (= 1/100th of a millimetre). Last week’s trip to the River Ehen involved close scrutiny of the hydrographs and weather forecast in the days preceding the trip, followed by some crude extrapolations that predicted that the river would be low enough for us to enter. Nevertheless, there were some anxious moments when we first arrived and gazed into the fast-flowing water. It was an occasion when I was glad of my veterinary gloves which afford some protection as I have to plunge my arms into river almost to my shoulder in order to pluck stones from the bottom. 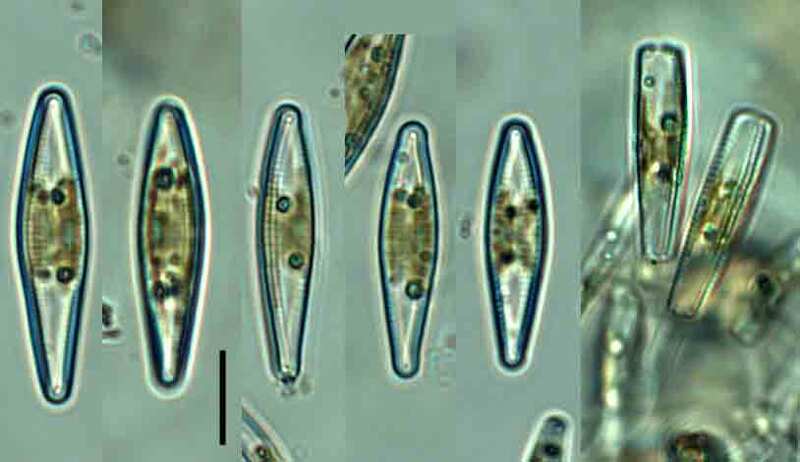 The top surface of many of the stones had conspicuous chocolaty-brown patches which are a sign that the diatoms are growing vigorously. We had been surprised that the amount of algae in the river had been quite low compared to our previous measurements in the autumn and had wondered whether the mild weather had allowed the natural grazers in the river to persist for longer than was the case last year. Now, with a distinctly autumnal chill in the air, the diatoms no longer seem to be held in check which lends credence to this theory. If true, it is a good demonstration of just how important “top down” processes are in controlling the quantities of algae that we see in our streams and rivers. Chocolate-brown patches of diatoms on the upper surfaces of cobbles on the bed of the River Ehen (Mill) in November 2014. Under the microscope, these brown films resolved into a mass of diatoms, along with a few filaments of Bulbochaete (see “The River Ehen in August”). There were two species of Gomphonema species which live at the end of long stalks: G. acuminatum (see “The River Ehen in February”) and G. truncatum, plus other, smaller Gomphonema species. There were also a lot of long, needle-like cells of Fragilaria tenera, many of which were joined at their bases to form hedgehog-like bundles of cells. My guess is that these start life attached to either the rocks or other algae but that they easily detach, especially when manhandled onto a microscope slide, and appear to be free-living. 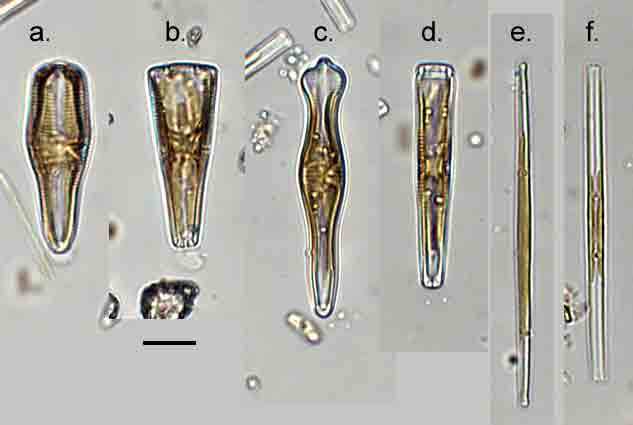 Common diatoms from the River Ehen (Mill), November 2014: a. Gomphonema truncatum valve view; b. G. truncatum girdle view; c. Gomphonema acuminatum valve view; d. G. acuminatum girdle view; e. Fragilaria tenera valve view; f. F. cf. tenera girdle view. Scale bar: 10 micrometres (1/100th of a millimetre). 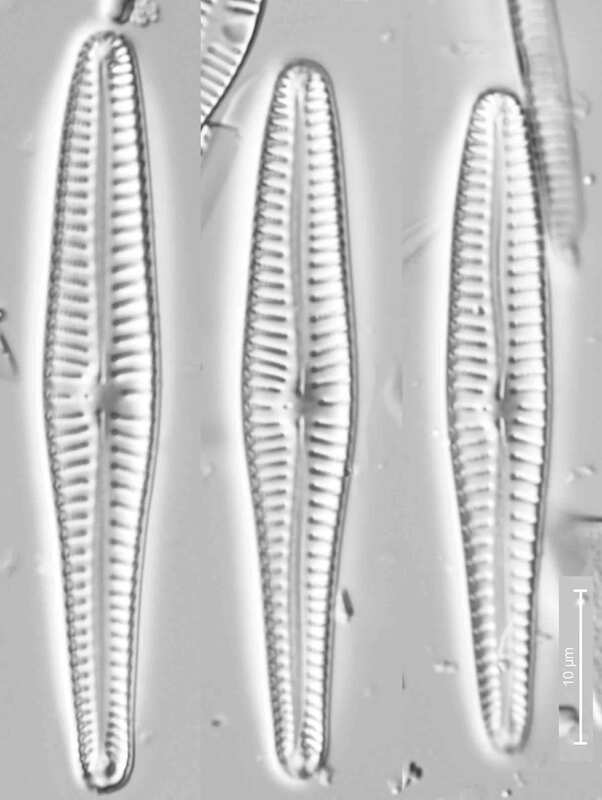 Ten or fifteen years ago I would not have referred to this diatom as “Fragilaria” but, instead, would probably have called it Synedra tenera. Older identification guides (such as West and Fritsch’s British Freshwater Algae, from 1927) differentiate between Synedra and Fragilaria based on whether or not the cells form ribbon-like colonies (Fragilaria) or are solitary or form radiating clusters (Synedra). From the 1980s onwards this simple dichotomy was unpicked just enough to demonstrate that it was too simplistic, but not enough to enable our esteemed taxonomists to put all the pieces back into a coherent whole (a story for another day …). However, the evidence at present leans to the narrow needle-like species that once belonged to Synedra actually sharing more characteristics with true Fragilaria. I call this species Fragilaria tenera with mild trepidation, knowing that there is at least one other needle-like Fragilaria present in the upper Ehen and, moreover, that a paper has recently been published (though I have not yet read it) in a rather obscure German taxonomic journal that dissects this complex into yet more fragments. Research on Fragilaria has, alas, generated rather more heat than light over the past couple of decades. A colony of Fragilaria tenera from the River Ehen, image produced using Helicon Focus stacking software. Individual cells are approximately 50-60 micrometres long.